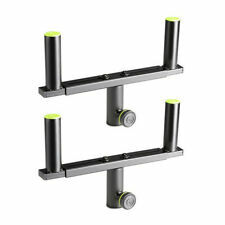 E-studio Pro Speaker Stands, Pair. Immaculate Condition For Full Size Pa Systems.. With bag. Pair of Adjustable Sub/Sat Speaker Pole. Designed for use between a sub and mid/hi cabinets the adjustable height distance pole from Pulse represents excellent value for money while retaining strong build quality. Gravity SAT 36 B Adjustable Mounting T-Bar for 35mm DJ Disco PA Speaker Stands. M20 Adjustable Sub/Sat Speaker Pole. Lower pole- M20 thread. Upper pole- Standard 35mm. Thumb screw friction block. Steel safety locking pin. Max load- 40kg. Condition is Used. Collection in person only. 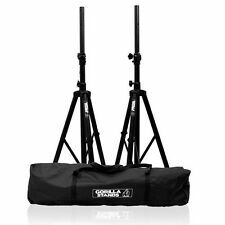 2 X Pair Of Speaker Stands With Bag. Includes: 4 x stands, 2 x bag. Load Capacity: 45Kgs. Suitable For All PA Speakers With a 35mm Top Hat Fitting. Superb Quality And Value. These height adjustable PA speaker stands from Gear4music boast solid construction with bolt and safety screw connections. This set is ideal for gigging bands and musicians. PA Speaker Stands (Pair) With Carry Bag Details. Can I reserve item(s) that I intend to buy later?. Pairs of Speakers. How do I find the item number or product code?. When will I receive confirmation of my order?. Product Code: XXA2931. What if I have not received my order?. PA Speaker Stand Pair 25kg Max. Material: Aluminium. Speaker stand pair – for speakers with 35mm flange connections. 2 x Speaker stands. Adjustable height: 2m max. NJS 35mm Adjustable Aluminium PA Speaker Stand 40KG Max Load Inc Warranty. The steel design on this affordable speaker stand make it both lightweight and durable. Stand features include heavy duty locking knobs and pin position safety lock. Black powder coat finish. Weight: 2.6kgs. Overall good condition, used but solid. All work ok, extend to 11ft tall, standard 50mm sockets on top. A Pair of lightweight alloy speaker/lighting stands. Base: Tripod. 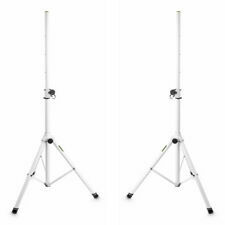 Q series steel speaker stand pair with folding legs. - Maximum load: 50 kg (132 lb) per stand. - Colour: Black. Our online presence were growing on a huge scale. - Weight: 3.25 kg (7.16 lb) per stand. 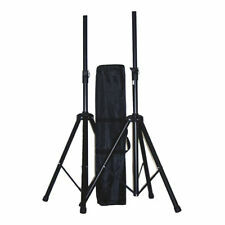 Pair Vonyx Tripod PA Speaker Stands with bag 30kg load each. 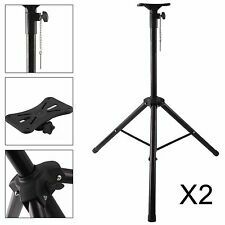 2x Tripod Speaker Stands. Tripod design. These heavy duty speaker stands fromVonyx are perfect for mounting your loudspeakers above your crowd to project your music across the room. Angled (approx. 10°), stable steel version, black lacquered. Length: 198mm. Push-on tilting adapter for speaker stands. Add to Favourites. The Gravity T-Bar facilitates mounting two loudspeakers on a single stand. 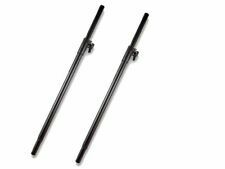 It is made of heavy-duty steel with a black powder-coating finish and securely attaches to all 35 mm poles. Width is fully adjustable from 31 to 49 cm. Steel speaker stand, stable tripod construction. Pronomic PLC-1S speaker stand steel 2x Set. Sturdy stands for PA speakers don't have to be expensive. The new speaker stands from Pronomic are the best proof. High quality : professional loudspeaker stand made of steel. Professional loudspeaker stand made of high quality steel. The height can be varied from 134 - 205 cm. Speakers with a weight of up to 70 kg can be easily attached. Can I reserve item(s) that I intend to buy later?. How do I find the item number or product code?. Air Conditioners. What if I have not received my order?. Product Code: TTB0342. When will I receive confirmation of my order?. 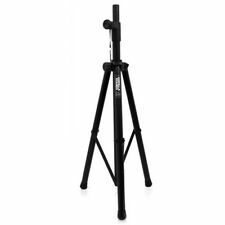 Malone Tripod Speaker Stand for PA Speakers 25kg Load - Silver. load capacity: 25kg. Material: aluminium. Silver finished aluminium with maximum load capacity of 25 kg. Speaker stand for speakers with 35mm standard flange fittings. 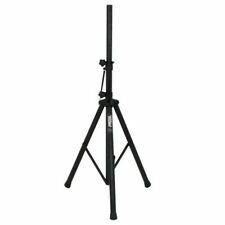 NJS Adjustable Black 35mm Aluminium PA Disco Speaker Stand Max Load 40kg. Omnitronic Wind Up Speaker Stand. M20 thread. Height adjustable via crank 80-110 cm. Weight: 3 kg. Adjustable height: 80-110 cm. Professional grade tripod speaker stand. SWL: 60 kg. Weight 3.2 kg (Single Unit). Material: Steel. Gravity Adjustable T Bar for Speaker Stands. Adjustable T-Bar for Speaker Stands. 2 x 25 kg load capacity. Adjustable width. Integrated hex key holder. Ergonomic set screw knob. Designed to Hold 2 x 25kg. 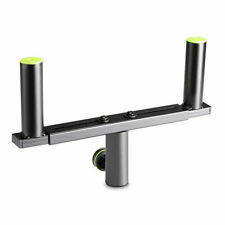 2x Gravity Dual Speaker Bracket (SWL 2x 25kg)The Gravity T-Bar facilitates mounting two loudspeakers on a single stand. It is made of heavy-duty steel with a black powder-coating finish and securely attaches to all 35 mm poles. G001YT Pair Heavy Duty PA P.A. 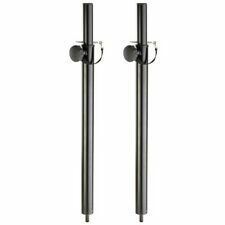 Steel Speaker Stands 35mm Pole Black.